New Year is the time at which a new calendar year begins and the calendar’s year count increments by one. In the Gregorian calendar, the most widely used calendar system today, New Year occurs on 1 January. Nepal follows Bikram Sambat and the new year occurs in Baisakh 1. Nepal being a tourism country and due to the influence from Western culture, the Gregorian new year Jan 1 is celebrated every year with full of cheers and enjoyment. The tourist areas of Nepal like Thamel, Pokhara, Sauraha etc welcomes new year with full of excitement and enjoyment. Still being Bikram Sambat offical calendar of Nepal, whole country welcomes the New year from the heart. The new year Eve on 31st December is celebrated with full of excited. Many concerts, programs are held in the new year’s Eve. The city of lakes Pokhara seems like a city of light in new year Eve. Many Nepali people, Foreigners gather at lake side and enjoy. The bars, hotels aside are full of the people and everyone are dancing, singing and welcoming the new year. The top bands of Nepal performs live concert and many cultural program are conducted. The new year is welcomed here from the sunrise viewed from Sarangkot, where people get amazed by seeing the rays of sun scattering in the white snowy peaks. Another city of Nepal, Chitwan Sauraha also welcomes the new year from the bank of Rapti river. The chitwan national park being a life habitat for several endangered animals, birds many tourists Visits this place. They are several lodges, hotels, bar, pub at the bank of Rapti river. The new year is welcomed in Sauraha by the wonderful sunrise seen from the bank. Coming to the capital city of the country Kathmandu, the tourist area like thamel, durbar square, Durbar Marg etc bring a new taste in new year celebration. These places are located at heart of Kathmandu. Many people including both Nepali and Foreigners together welcomes the new year here. The lights, sounds, the environment all gets electrifying here. People keep dancing whole night and the concert runs whole night. The city doesn’t sleep whole night. Many people visit nagarkot, Daman etc at new year where perfect view of new sunrise can be seen. The effect of New year also hits toward the market. Many companies provide special offer, discounts, sales etc on the occasion of new year. The big malls, shopping centers etc gets decorated like a bride. The new movie hits at town on the occasion of new year. The celebration of new year help to increase the economical aspect. People travel, lodge, drink eat during the new year which lets the increase of money and employment. Specially Foreigners spends their currency which overalls leads to the economic growth of country. Besides our tradition and culture is also displayed to them from their performance in new year .As English new year is celebrated with full of excitement and enjoyment, the excitement and celebration of Nepali new year is decreasing. 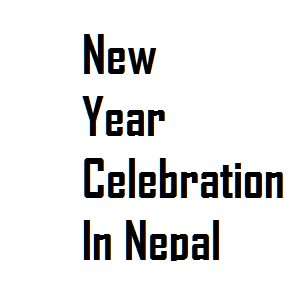 English new year is not the Nepali culture, but due to foreign influences the craze of people are increasing towards English new year than Nepali new year which is not a good sign. The celebration of English new year is good respecting their calendar, but refusing the celebration of Nepali calendar leads toward the destruction of our tradition and culture. This increases the Western culture take over to our culture. Generally the Jan 1 falls on Mid of Paush. The winter season is being hitting in the country. Cold is shivering in the town. But ignoring winter people enjoy the new year by heart and welcomes the Gregorian New year with full of respect.